By the vagaries of random chance, I got a foil version of this card in the same booster as a Benthic Biomancer. It seems like the spirit of Magic might be trying to give me a hint! This card was presumably intended to interact with the Simic’s adapt ability here in Ravnica Allegiance, but it obviously works at least as well in older card pools. Even if you just take advantage of the similarities between adapt and monstrosity and make Polukranos cheaper to use, that can be pretty dangerous to some decks. Beyond that, there are plenty of decks in casual and Commander settings based on synergies between various activated abilities. If you can make the mana work, I wonder how it would combine with Ashling the Pilgrim and the similarly templated flamekin cards from Lorwyn. I also noticed that they managed to include the “can’t reduce a cost to less than 1” clause as though it’s 1994 again, which is probably just as well. There are enough ways to make Prodigal Sorcerer variants to go infinite as it is! Training Grounds has always been a promising “build around me” target, and Biomancer’s Familiar offers something to both its own deck and Simic-colored decks in general, if for no other reason than that Training Grounds-like effect. 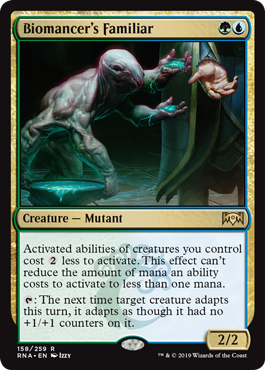 Never underestimate the ability to make abilities cheaper, especially Simic’s bevy of adapt abilities (and the related monstrous mechanic); while Biomancer’s Familiar is rarely an amazing turn 2 play, it does pay off as you amass your army. That tap ability can also be a nice boon, making your adapt creatures able to get larger and more menacing. I feel like Biomancer’s Familiar is apt to be a nice roleplayer in Standard, though a 2/2 body is maybe a bit too vulnerable to removal to really have an impact outside of it.